We spent hours, days even, planning the menu, shopping for ingredients and prepping for our Christmas dinner and it was over in the blink of an eye; or at least that's how it felt. This year my husband and I decided to veer from our traditional Christmas feast which would've included several courses; soup, pasta and meat. Instead we did just one large meal with all the recipes coming from the December 2008 Bon Appetit magazine. Our entree was a very impressive Standing Rib Roast stuffed with spinach and porcini mushrooms and served with an Irish whiskey gravy and horseradish cream. There wasn't a lot of stuffing to this recipe but the flavors of the spinach and porcini mushroom complemented the meat perfectly. If I had to change one thing it would be the gravy. Although we enjoyed it, we agreed that it was a bit much for the meat. A little salty and a little overpowering. Potato Mushroom Gratin...definitely my new favorite way to make potatoes. 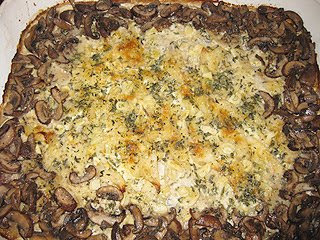 Thinly sliced potatoes layered with heavy cream and grated Parmesan topped with mushrooms, sliced garlic and thyme. What could possibly not taste good about this? 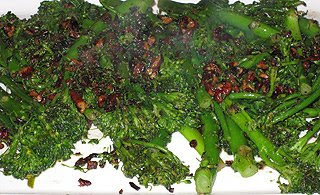 and Brocollini with Pecan Brown Butter. Some people say that brocollini is baby broccoli. Others say it's a cross between broccoli and Chinese chard. Whatever it is it's delicious especially sauteed with brown butter and pecans. And what would standing rib roast be without Yorkshire pudding? 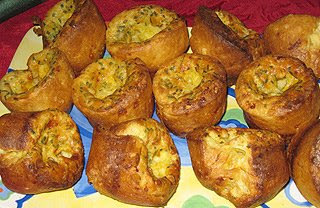 These individual puddings were filled with sharp cheddar cheese and chives. 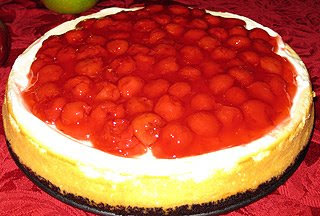 and my husband's famous Oreo Cheesecake with Cherries. He's been making this every Christmas for as long as I've known him. Which, by the way, is a very long time. What a delicious spread, everything looks amazing! The potatoes and the yorkshire puddings are especially calling to me! What a meal!! That rib roast looks outstanding, and so does everything else!! I'm so glad I'm not the only Italian who veered away from tradition! 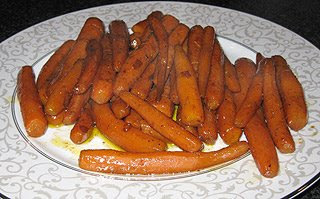 :) Your roast looks and sounds amazing! I would love to know, what was the dominant flavor in the gravy.. the red wine or the whisky, or did it all meld to a new flavor? It sounds yummy! I was to lazy to make the yorkshire pudding.. i'm so glad I get to dream about it by looking at yours though!! Brava!! 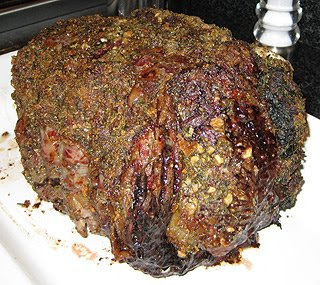 That standing rib roast is making me salivate! It looks just gorgeous - and the stuffing was delicious I bet! Oh my! those Yorkshire puddings look so good, as does everything. I can't believe I am looking at food after all this holiday eating. This meal looks amazing........I can't believe it is over either. I lived in AZ back in '93, down towards Tucson.